Pastor Tunde Bakare, a former presidential running mate of General Muhammadu Buhari in 2011 and Serving Overseer of the Latter Rain Assembly, says any right thinking Nigerian will agree that President Buhari has performed ‘so woefully’. The clergyman said this in an interview with Channels TV. 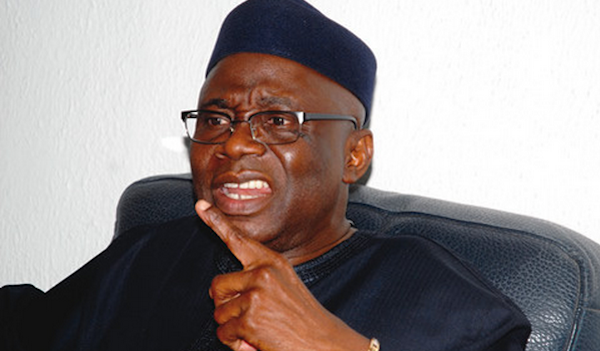 Mr. Bakare said: ’’No matter how you look at it, this is not the government we all hoped for. This is not what we thought this government that promised change at the beginning will perform so woefully. Any right thinking Nigerian will agree with that. But you can then begin to do the blame game that began in the garden of Eden; It is the woman you gave me, it is the ministers that are not performing, it is the ill-health of Mr. President himself… You can also blame the past administration. But you knew what you were going into, even if you didn’t know all of it…vThey could have done better than what they have done so far. They themselves know that, ’’he said. Asked whether the Buhari he knows is nepotic, Mr. Bakare said: “I had no reason at the time I ran with him to ever believe he was nepotic. There was no reason because he did say to me you will assembly the best and the brightest from the East, West, North and South of our country to fix the nation. But when I read what Obasanjo wrote, and I saw the list of key appointments made, you would begin to think whether they just put the things on his tabel to sign or is this just what he did deliberately. That is food for thought’’. Good afternoon Aunty Adeola, trust you're doing good, firstly I will like to appreciate you for your good works especially on social media platform, I watch your videos on YouTube and I'm a subscriber. Once again thanks a lot but I just wanted to bring this to your notice about the way most persons especially here in Lagos go through to get PVC, in fact I practically left home 6am only for me to meet a very long queue, not only that, but the officials attends to 40 persons daily!!! I mean that's terrible and most of us has to go to work! I believe the government listens to you biko come to our aid, besides its closing in march….. I hope you get this message soon, I understand your tight schedules too, Ese gan! !